Even though the world is getting much safer, despite what the media seems to think, that’ doesn’t mean we can get complacent with home security. Luckily, technology has evolved far enough that we no longer have to sit on our porches with a shotgun and surly frown to ward people away. Instead, little security cameras that are discreet, weatherproof, and which can be remotely accessed have made thousands of people feeling safer in their homes. If you want to feel confident about your home having the best security, then you need the best security cameras, and the good news is, we’ve got just the list for you to find the right products to ensure you’re always watching. We live in a world with enough video surveillance as it is, so what’s a little more, hey? The trustworthy and highly capable Arlo Technologies Q is our first choice for the best security camera on the market. This little camera comes at a reasonable price of under $100 in the standard pack and has proven to be an excellent solution for those looking to keep the inside of their home safe from intruders. With a two-way audio feature, you can both hear and be heard, giving you the chance to alert anyone who shouldn’t be there that you know exactly what they’re up to, while the night vision filming ensures 24-hour protection. As standard, it comes with 1080p recording, which for most of you we’re sure is the very minimum resolution you’d expect. This smart home device is also compatible with Alexa, which makes for easy operation as soon as you step in the door. In addition to this, there’s also motion sensor technology, activity zone monitoring for the areas of the home you feel are most at risk. To ensure the widest possible angle, the Arlo Q has a 130-degree field of vision to capture every movement in every corner. If you purchase this particular camera, you’ll also get a rolling 7 days of storage, so if you’re away from home and come back to something you didn’t expect, the footage won’t be lost forever. The only problem is that you can’t use it outside as it’s wired, however, this is possible with the wireless version. The Blink XT Home Security Camera System provides you with protection both inside and outside the house thanks to a weatherproof casing that ensures full reliability in the darkest, windiest and most violent storms, so you can view all of the terror from the comfort of your home. It’s more than a mere makeshift mortality reminder, though. It’s also useful for keeping your home safe from intruders, traveling salesmen, and will give you a bit of warning when the in-laws make an unannounced visit. The built-in motion sensor works to alert you whenever somebody – friend or foe – gets too close, while The HD video recording ensures you get the clearest picture of whodunnit if anything was even done at all. These security waterproof cameras are also long-lasting, with one charge providing at much as two years of battery life. Aside from keeping you from forgetting to replace the battery every couple of months, it also guarantees you’ll capture everything possible, which can be uploaded to the free cloud storage. Like the Arlo Q, it’s compatible with Alexa, giving you further control, however, unlike the Q. it only offers one-way audio, so you’ll be able to listen to what’s going on, but you won’t be able to treat those on the screen with any of your witty, superhero-esque one-liners upon capturing them. We guess they weren’t ready for their close-up, hey? This security camera system is a total package in delivering sudden, surprising blinding light, as well as capturing exactly who’s standing there, bathing them in the light of shame and confusion we’ve already come to expect while also keeping your home – and by proxy, some of the neighbor who should definitely get you a bottle of wine or something – safe from weirdos, scammers, and general scumbags who should look elsewhere. To provide you with the most control imaginable, it’s compatible with Alexa voice commands, and has a two-way audio system – so you can use your cheesy one-liners – while the 1080p video resolution gives you a clear video image, so you’ll be able to easily tell whether it’s grandma or some escaped convict stalking up and down your driveway. To give them (the cons, not grandma) even more of a shock, the Ring Floodlight Cam won’t just shower them with the wrong kind of Biblical light, but also invade their ears with a siren that’s sure to get them out of there quicker than an intruder coming face-to-face with a naked man armed with an axe, determined to protect his property. Sorry for that image, but we’re trying to prove a point here. 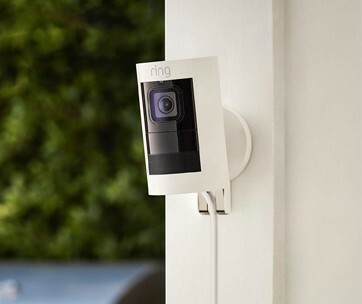 The camera system can also be connected to a variety of devices, giving you a constant link to your home, and the motion-activated alerts will keep you aware wherever you are. With it being outside, Ring also provides a lifetime theft warranty – because of course, that’s the next step for thieves. It does require hardwiring to ensure proper weatherproofing, which could be inconvenient, but it’s hardly the end of the world. For more great safety options for your home, check out our guide to the best smart locks. This YI Home Camera is a discreet and sleek model that will fit comfortably and modestly in any office, home or nursery environment. It’s lightweight and provides real-time alerts through the YI Home App, keeping you forever in the loop whether you’ve stepped out to do some yard work, or are enjoying a much-deserved vacation sipping a cold brew or fancy cocktail on golden shores. Out of all of the picks we’ve selected, it may have the very best night vision, which is its main selling point. Using 8 individual 940nm infrared LEDs, it captures low-light and nighttime images like little else – aside from perhaps that used by the military. If you live somewhere with few streetlamps or parts of the country where the city is too slow to repair light sources, this is crucial for providing the top level of security as well as peace of mind, which is what these home security cameras are really about, right? You’ll also be gifted to a choice between SD card or Cloud storage to store as many days worth of footage as possible, which is particularly useful if you invest in more than one of these cameras and set up the multiple feed feature. However, the camera itself can only mount SD cards up to 32GB, so if you’re planning on getting every angle of your home inside and out covered, this may not be enough. In that case, a 360 camera might be perfect for you. Our selection for the coveted Premium Choice of the best security cameras is the Arlo Technologies 2 Home Security Camera System. 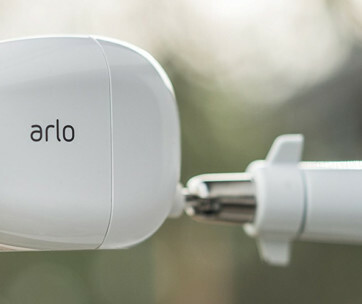 Unlike the Arlo Q, it offers wireless connectivity, which means it can be used outside as well as inside and provides full coverage all over the house, the neighborhood, and beyond, although that’s not something we think you’ll need to do. Boasting the standard 1080p video resolution, as well as a fixed focus range of 2 feet all the way to infinity – which you might have to see yourself to actually believe, you get something that is almost unrivaled in the security camera industry. Along with this, it’s compatible with Alexa, has long-lasting, and also solar powered batteries, as well as an array of Arlo Smart extras that maximize your control and confidence in home security. Furthermore, you can also set up priority zones around the areas of the house you’re most concerned about, unfortunately, this can only be achieved when the camera is plugged in, which means you’ve got to arrange them specifically to suit this. Other than that, though, this wireless security camera system offers everything you could ever want to keep your home safe and sounds. You’ll be paying more than the average camera, but what you’re paying for is the premium quality that’ll last this year, next year, and beyond. No more inspecting mysterious bumps in the night, just check camera XYZ on your app. Not that you’re afraid or anything. Our handy guide to the best trail cameras features more great products like this, so check it out! The Wyze Cam Smart Home Camera – that looks just a little bit like the Pixar Lamp – us an excellent budget choice for anybody looking for a sounder sleep and more enjoyable trips away from home that unlike some budget models provides excellent night vision thanks to the 850nm mini infrared LED technology. In addition to this, there are motion tagging capabilities which detect and outlines whoever appears on the screen, all of which is done in crisp 1080p resolution. You can activate live streaming to your smartphone, laptop, or tablet day and night as long as your gadget is above iOs 8.0 or Android 5.0, which we would assume it is. Furthermore, with Alexa compatibility, you can politely request she (or should we be saying it?) show specific points of the home if you’ve got more than one setup. Multi-placement options are also simple. The magnetic base helps secure it to metallic surfaces as well as having a second option for an adhesive base. Either way, you avoid screws, noise, and potential misjudgment. Unfortunately, it will only work with wifi operating at 2.4kHz and is not compatible with 5kHz, so if you’re someone who has the most advanced devices in your home, you might not have the chance to bring this into your house. If you’re looking for an effective, intelligent security device at a great price, then the Canary View Indoor HD Security Camera is definitely something you should look into. This 1080p full-color video recorder offers a great – if slightly limited – package that at the very least will eliminate sleepless nights and the very most capture something before disaster strikes. Not that we’re trying to scare you or anything. Compatible with Alexa and with the ability to unsuspicious ignore moving parts of the house, such as the ceiling fan, you do have at least some customization and control options. Furthermore, the one-touch emergency services alert is an excellent addition that we hope you never have to use. There’s also privacy and night modes that ensure the camera doesn’t capture any intimate (wink wink) moments. It is, however, a little large for our liking at least when compared to other, similarly priced products, but this size helps it be more durable and eliminates additional connectivity hubs that may end up taking up more space anyway. It’s really down to your own needs and preferences, and if size isn’t an issue for you, then there’s enough contained within this camera that you can trust. To feel safe in your car too, make sure you pick one of the dash cams from out list. The Hive View Security Camera is a top-quality single camera that might cost more than other solitary products on the list, but this is with good reason. Aside from looking sleek, modern, and stylish – which might not be the USP in security cams, but is always nice – it is motion activated, instead of working around the clock, which helps save on energy, and potentially hours of scrolling through empty video. This recording is done in 1080p, so you can be that when something does happen, you’ll capture it in perfect, clear footage at a wide angle of 130-degrees. It’s also compatible with not just Alexa, but also Google Home and IFTTT recipes that provide you the ultimate level of control over your home recordings. The two-way audio system is also useful for giving strangers a fright without them realizing, while the wireless and compact design means its easy to place anywhere in the house, as well as move it someplace else if the need arises. 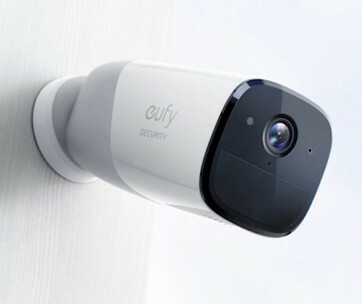 This makes it more than just a wifi security camera, but also something that allows you to keep an eye on the kids or the pets without charging across the house when things are suspiciously quiet. Even though it looks more like an early-2000s webcam, this EZVIZ Indoor Security Camera, developed by Hikvision, is a quality, budget security camera designed to keep you protected day and night, and that often-creepy midpoint in between. Compatible with Alexa, as well as other smart home products through the magic of IFTTT, you can control as much of your home as you want to all from your phone. The installation is easy, requiring you to simply mount it wherever you need and connect it to the wifi or smart home system. The night vision is activated automatically and detects motion up to 24.6 feet away when this happens (both at night and during the day) you’ll receive an alert and picture delivered to your device so you’re always aware of what’s going on at home. Unfortunately, it only provides 720p video, which while it might be almost indecipherable to the human eye, is of course of lesser quality than other picks we’ve presented you thus far. This could mean you miss out on small details in the event of a break-in, and could even affect the night vision features in providing the clarity required in low-light situations. 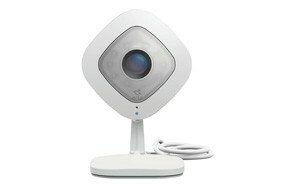 Our final product is another EZVIZ, this time the EZVIZ Dome Security Surveillance System. Unlike the other products on the list, this camera provides 360-degrees of viewing possibilities and gives you the option to tilt, zoom, pan, spin, roll, and end world hunger – okay, maybe not that much – all in one useful, space-age style camera. The 1080p resolution is a step up from our previous EZVIZ pick, while the intelligent motion traction acts like a security-bot intent on keeping your home protected at all costs. To ensure that you never lose a second of footage, you can set up the cloud storage feature, as well as connect it to Alexa, Google Home, and IFTTT to give you unlimited control. For additional peace of mind, there’s privacy protection options as well as real-time two-way audio if you see you kid doing something that they know they shouldn’t be doing. Remember, it’s not spying on them if what they’re doing is going to cost you money. There’s truly a lot to love about this excellent security camera, although, we wish it wasn’t so large, which makes it a challenge to conceal if you’re looking to maintain a certain aesthetic in the home. You also don’t get a microSD card supplied with it, so until you do, you’ll need to rely on cloud storage. This isn’t a major issue, but if you prefer your footage on hardware as opposed to software, then you might want to look for something else. Despite this, we do still very much like this little disco-ball-esque camera and its always-watching which is why it makes a perfect electronic gift for any tech lover. Before buying the best home security camera on the market, you must first be aware of what to actually look for in one that will make it the best for you. Resolution - High resolution means you get crisper and more clear images. This is crucial for identifying parts of intruders that lower resolution cameras might miss, or even getting every detail possible if your kid breaks something in the house, but you’re initially unsure how. Plus, we’ve gotten to the stage where anything below 720p at the least makes our skin crawl. Night Vision - Crime and mischief don’t stop when the sun goes down, the very opposite, actually. A camera equipped with night vision means you’re protected 24 hours a day. Recording Capacity - A higher recording capacity means you can record more footage. These security cameras come with either the capability for storing footage on an SD card or on the cloud. The cloud will provide a rolling 7 - 14-day recording, while you’ll have to manually delete any footage on an SD card. This comes down to preferences. Remote Access - You can’t always be at home, so remote access is essential for alerting to what’s happening in and around your home in real time. As long as you’ve got a connection, then you’ll be able to keep up-to-date with any motion or suspicious movements, even if it’s as innocent as a squirrel darting across the lawn. This peace of mind s essential when away from home, especially for a long time. Wired Or Wireless - A wireless camera offers you more options around the house, but also means that they can be moved easily and even covered by intruders. Conversely, wired cameras aren’t as waterproof, so you lose outside filming options. There are advantages and disadvantages to both, so again you decide what’s best for you. Pan and Tilt - Not in the dramatic cinematic climax sense but in more of a ‘capture as much of the areas as possible’ sense. Pan, tilt, and even zoom options are great advanced features to give you that extra level of control if your home camera doesn’t have a wide viewing angle or if you don’t have many cameras set up in one spot. Q: What are the best security cameras for home? A: Finding the best security camera system for you isn’t easy, and we can’t tell you which is best, at the risk of looking like we want you to spend more money or have merely picked one name out of a hat. What we can tell you though is probably what you already know: everybody has different security camera needs, and not all of those are necessarily security related. You might need one to keep an eye on the kids or to catch a certain woodland critter that keeps disrespecting your lawn. Due to these factors, we’re unable to recommend any one product. We can tell you that the best one for you will be somewhere in the above list. Q: Which is better NVR or DVR? A: Do you want a network video recorder or a digital video recorder? An NVR records footage from an IP camera while the DVR - much like the one in your living room - records analog-based cameras, which are sometimes known as coax cameras. They are both easy to operate and both of them provide you with essentially the same resolution and recording capabilities. however, if you’re not as good with tech as others, then the NVR might pose a slight challenge, but nothing that can’t be easily overcome with a little research, and some may even recognize the system automatically. What it comes down to is how beneficial they will be in the future. DVR could become obsolete which means you’ll waste time setting it up and spending more money in the long run. If you’re okay with this, then pick DVR, but we’d really have to recommend NVR for the fact it will be useful for longer. Q: Do you have to have WiFi for wireless security cameras? A: Yes! Otherwise, it’s not exactly wireless in the truest sense of the phrase. Wifi enabled security cameras are also just a little more convenient, as you don’t have wires running throughout the house that could be tripped over by you, your partner or - more likely - kids running around with reckless abandon. Wifi extenders can help with boosting the signal to keep a better connection to the security cameras. However, you can connect some cameras inside the house to your router using an ethernet cable if it’s close enough to not become an obstruction. In all instances, you will need power to the router for the wireless security camera to operate. Q: Do security cameras work without power? A: Yes! Or at least the ones that have a backup power supply, work wirelessly, or through solar-powered charging will work without power. These are excellent options for when potential thieves are a little smarter than your average crook and go as far as to cut the electricity to your home before attempting to get inside. However, if you have a camera hardwired to the mains and without a backup source, then we’re afraid you’re out of luck, but at least you’ll know a little bit of what’s happened before the feed cuts out. Q: Should you get video surveillance for home? A: If you want to purchase a video surveillance camera then purchase a video surveillance camera - why else would you be here? Not only do surveillance cameras protect you in the event of theft, but they also provide peace of mind while you’re out of town. In addition to this, they don’t have to be used purely as security cameras. You can use them as baby monitors, pet monitors, or as a peep-hole alternative. We said at the beginning how we shouldn’t get complacent with home security, and while these cameras won’t always prevent theft, because some thieves are stupid, sometimes don’t realize, or simply don’t care about your cameras, they will at least serve as a warning to others that they’ll be caught on camera, which is usually enough to put them off.